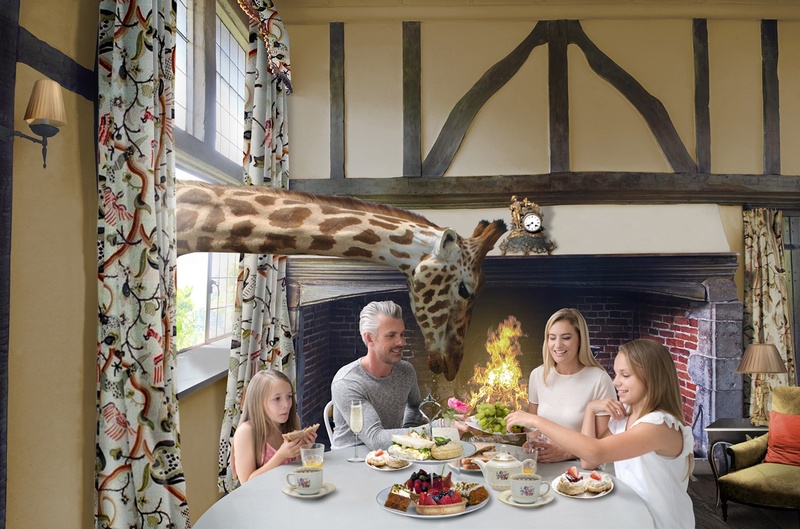 The countdown has begun to the most sensational and unique accommodation opening in the UK at Port Lympne Hotel & Reserve in 2020 – Giraffe Hall. The first of its kind in the western hemisphere, Giraffe Hall will offer guests the chance to get closer than ever before and make friends with their giraffe neighbours, as the resident herd peer into the lofty ceilinged drawing room, or amble up to the bedroom windows, where guests can feed them. Giraffe Hall is a Grade 2 listed Wealden hall house, dating back to the 15th and 16th Century, currently undergoing extensive restoration to create a luxury 10 bedroomed hotel, with a further six luxury cabins, providing unrivalled views over the Reserve, nestled in the grounds. 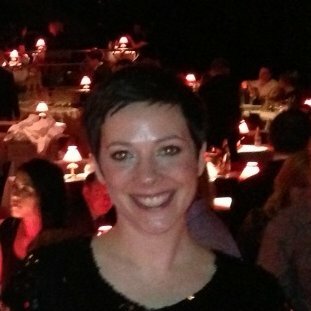 The interiors will be designed by Victoria Aspinall, retaining many of the outstanding original features. Once completed, the hotel will offer a luxury safari feel, whilst incorporating the comforts and décor of an English stately home. Originally part of the Port Lympne estate, the house was extended by Philip Sassoon to add two further sections, during a full renovation carried out in 1920 by H. Charlton Bradshaw. Sassoon was Member of Parliament for Hythe and Private Secretary for Field Marshal Haig during WW1. He famously used the estate as his country weekend retreat, entertaining guests including Winston Churchill, Lawrence of Arabia and Charlie Chaplin. 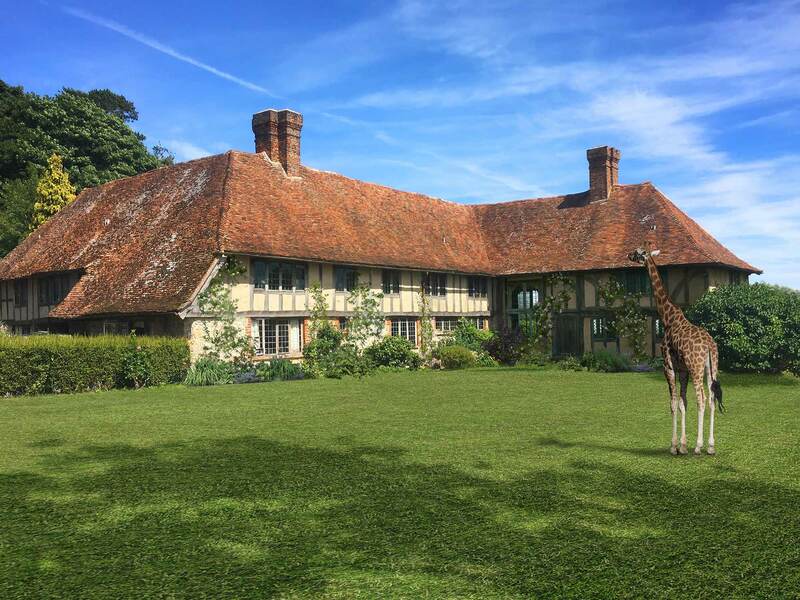 Giraffe Hall is situated at the top of Port Lympne Hotel & Reserve, overlooking The African Experience, surrounded by stunning landscaped gardens, offering 30 mile views over the Reserve’s savannahs where animals roam freely, to the coast beyond. The gardens are also undergoing improvements which will not only include a route for the giraffe to wander the grounds but also a cabana style retreat, where guests can take in the stunning views, whilst relaxing with a drink. Once opened, Giraffe Hall will not only offer a once in a lifetime holiday destination but will also become a sought after venue for weddings and private parties. Due to popular demand, the Reserve has created a ‘waiting list’ of excited potential guests, eager to be one of the first to experience this incredible destination. To sign up to the list please enter your details here.